Local farmer’s markets have sprung up across the capital over the last few years with more and more people enjoying their weekly trip to source the best produce around. No matter where you live, it’s guaranteed your local farmers market will have an interesting and fresh variety of produce, meats, and lots of other things you need to try, from prepared foods to artisanal products. 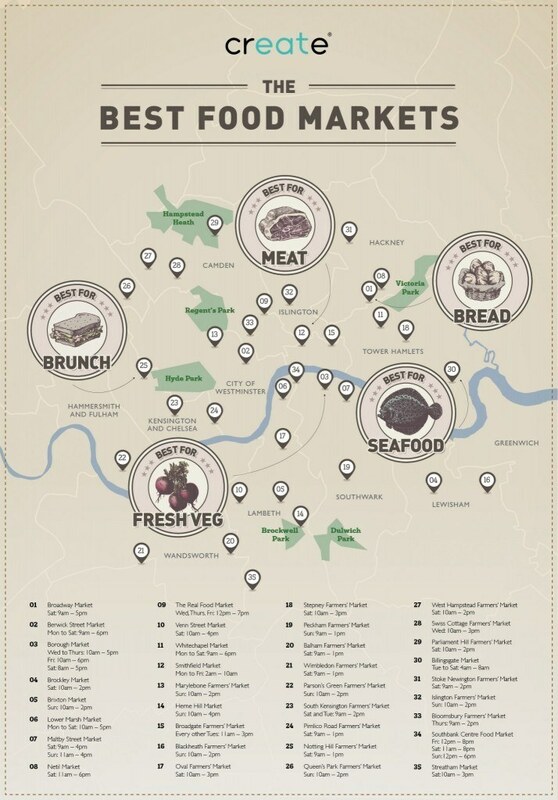 We’ve put together a little map of all our favourite food markets in London. Why not do some exploring this weekend, pick up some fresh, seasonal ingredients and create something delicious. Perhaps you could even make these three phenomenal dishes designed by our Development Chef Euan Peach. Click on the image above to see our full info-graphic with links to all of these fantastic markets. Let us know how it goes by tweeting @Createfood, we’d love to see what you buy!